Why choose Go Gear 4 You Carabiners? Safety is our #1 concern - We feel our carabiners are strongest and most durable on the market and so will you, we guarantee it! Suitable for camping, hiking, hunting boating,climbing, caving, exploring, rappelling, rescue, engineering protection, aerial work, etc. The perfect gift, so feel free to BUY EXTRA for your family & friends! Click ‘Add to Cart’ now to get two versatile carabiner clips strong enough to take with you on nearly every outdoor adventure! 100% satisfaction guarantee! We are so confident that you'll love our product that it is backed by our manufacturer 30 day money back guarantee with a 1-year free replacement warranty. 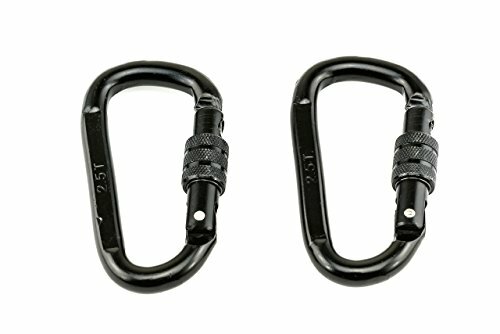 These carabiners can be used for hammock straps, backpacking, camping, rappelling, rock climbing, rescue, hiking, traveling & more. Single-Hand Operation - The large knurled locking nut is easy to locate even in the dark. Stronger Than The Competition - These high-strength units are rated at up to 5,600 lbs. lbs! Rust & Weather Resistant - Safe for indoor and outdoor use. 100% Satisfaction Guarantee - We are so confident that you'll love our carabiners that it is backed by our manufacturer 30 day money back guarantee with a 1-year free replacement warranty. If you have any questions about this product by Go Gear 4 You, contact us by completing and submitting the form below. If you are looking for a specif part number, please include it with your message.